^ "Harry Belafonte - Calypso". AllMusic (All Media Network). Retrieved December 10, 2013. ^ "ACLU Ambassadors - Harry Belafonte". aclu.olrg (American Civil Liberties Union). Retrieved January 5, 2015. 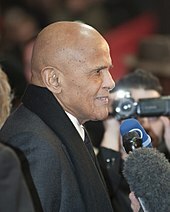 ^ a b "Awards search for Harry Belafonte". Emmys. Retrieved December 10, 2013. ^ "Harry Belafonte Biography (1927-)". Filmreference.com. Retrieved November 5, 2013. 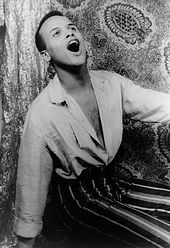 ^ "Calypso Artists: Harry Belafonte". Web.archive.org. February 8, 2009. Archived from the original on February 8, 2009. Retrieved November 5, 2013. ^ Belafonte, Harry (2012). My Song: A Memoir of Art, Race, and Defiance. Canongate Books. ISBN 9780857865885. Retrieved October 28, 2015. ^ Mottram, James (May 27, 2012). "Interview: Harry Belafonte, singer". The Scotsman. Retrieved October 28, 2015. ^ Belafonte, Harry (October 12, 2011). 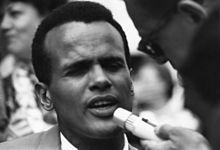 "Harry Belafonte: Out Of Struggle, A Beautiful Voice". NPR. Retrieved November 5, 2013. ^ Gilliland, John (1969). "Show 18 – Blowin' in the Wind: Pop discovers folk music. [Part 1] : UNT Digital Library". Pop Chronicles. Retrieved November 4, 2013. ^ "Odetta". WordPress. Retrieved December 10, 2013. ^ "Searchable Database - Search: Belafonte Makeba". RIAA. Retrieved December 10, 2013. ^ "MLK Appears on "Tonight" Show with Harry Belafonte". The Martin Luther King Jr. Center for Nonviolent Social Change. February 2, 1968. Retrieved November 5, 2013. ^ "NBC Sept. 11, 2001 8:31 am - 9:12 am". Internet Archive. Retrieved January 10, 2016. ^ "Anir Experience". Anir Foundation. Retrieved November 5, 2013. ^ Mottran, James (May 27, 2012). "Interview: Harry Belafonte, singer". The Scottsman. 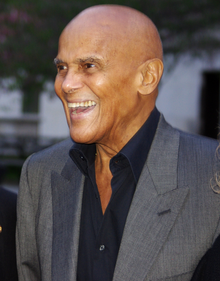 ^ "Harry Belafonte Fast Facts". CNN. July 7, 2013. Retrieved December 10, 2013. ^ Brown, DeNeen L. (January 12, 2014). 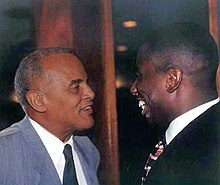 "Harry Belafonte challenges Phi Beta Sigma to join movement to stop oppression of women". The Washington Post. Retrieved January 14, 2014. 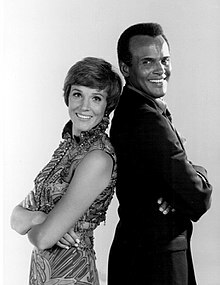 ^ "Commercials - 1960 - Harry Belafonte". The Living Room Candidate. Retrieved November 5, 2013. ^ Macdonald, Moira. "Movies | 'Sing Your Song' recounts Harry Belafonte's life". Seattle Times. Retrieved November 5, 2013. ^ "Tempest in TV Tube Is Sparked by Touch". Spokane Daily Chronicle. AP. March 5, 1968. Retrieved July 25, 2016. ^ "Bellafonte Hollers; Chrysler Says Everything's All Right". The Dispatch. Lexington, North Carolina. UPI. March 7, 1968. Retrieved July 25, 2016. ^ "Chrysler Rejects Charges Of Discrimination In Show". The Morning Record. Meriden–Wallingford, Connecticut. AP. March 7, 1968. Retrieved July 25, 2016. 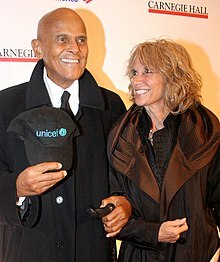 ^ "Belafonte says apologies can't change heart, color". The Afro American. March 16, 1968. Retrieved July 25, 2016. ^ "Belafonte Ire Brings Penalty: Chrysler Official Apologizes To Star". Toledo Blade. AP. March 11, 1968. Retrieved July 25, 2016. ^ "Harry Belafonte and prostate cancer". Phoenix5.org. April 21, 1997. Retrieved November 5, 2013. ^ "Feel Great. Save Money. Have Fun". AARP The Magazine. May 26, 2013. Retrieved November 5, 2013. ^ "Advancement Project". Advancement Project. Retrieved November 5, 2013. ^ "FrontPage Magazine - Harry's Hatreds". Frontpagemag.com. Retrieved November 5, 2013. ^ "Reception Honoring Oliver R. Tambo, President, The African National Congress (South Africa)". African Activist Archive. Matrix. Retrieved December 10, 2013. ^ Baker, Brent (October 10, 2002). "Belafonte Calls Powell Bush's "House Slave"". Media Research Center. Retrieved December 10, 2013. ^ "Venezuela plans to expand program to provide cheap heating oil to US poor". Taipei Times. October 29, 2013. Retrieved November 5, 2013. 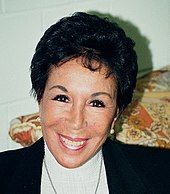 ^ "Belafonte calls Bush 'greatest terrorist' - World news - Americas | NBC News". MSNBC. January 8, 2006. Retrieved November 5, 2013. ^ "Harry Belafonte Comments" (Press release). AARP.org. November 1, 2013. Retrieved November 5, 2013. ^ Goodman, Amy. "Sing Your Song: Harry Belafonte on Art & Politics, Civil Rights & His Critique of President Obama". Democracy Now!. Retrieved December 10, 2013. ^ "NAACP Image Awards | Harry Belafonte Speaks on Gun Control in Acceptance Speech | Feb 1, 2013". YouTube. February 2, 2013. Retrieved February 19, 2013. ^ Grow, Kory (January 8, 2015). "Roger Waters, John Mellencamp Choose Interviewers for 'Speakeasy' TV Show". speak-easy.tv. Rolling Stone. Retrieved January 27, 2015. Sharlet, Jeff (2013). "Voice and Hammer". Virginia Quarterly Review (Fall 2013): 24–41. Retrieved October 4, 2013.